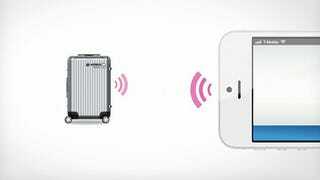 This concept case by Airbus, which pairs up directly with your iPhone, could mean you never lose your bag again. Called Bag2Go, it uses a GPS-tracker, 2G mobile connection, and an RFID chip built directly into the case itself to record its whereabouts. The idea is, primarily, to allow airports to pair its unique ID with handling systems—and in turn log its location against its owner's travel itinerary. But a paired iPhone can also show the owner data about the case, and even inform them if it's been opened.